I started the week being really healthy; lots of exercise and salads to get myself bikini ready for summer. However, after a mid week dinner at The Breakfast Club, where the food was really disappointing, and then coming home to Kent I have slipped rather badly. Instead I have been filling up on delicious food and glasses of wine - oops! I love coming back home and spending time with family and home friends. The sun shining has just made the week even better! 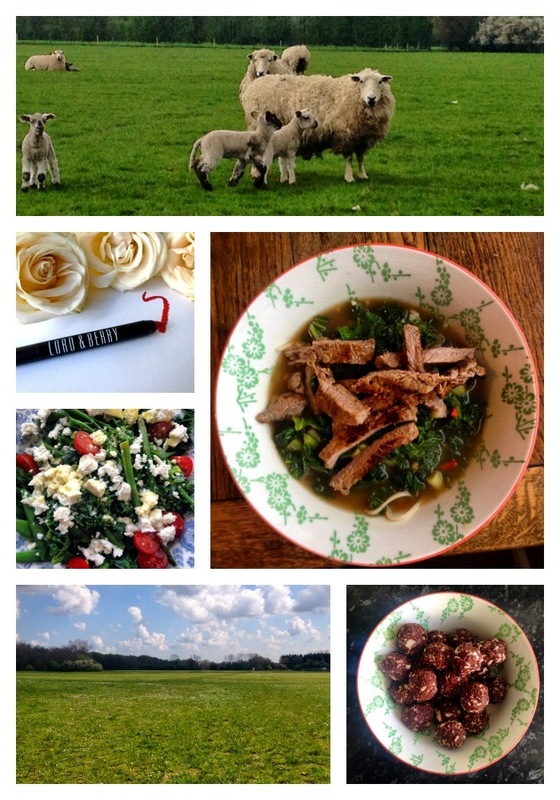 Photographs: Lambs // Beautiful Lip Product // Colourful Salad // Steak, Kale & Miso Soup (recipe coming soon) // Dog walking // Delicious healthy truffles, see recipe here on my friends blog. Posts this week have included: Patty & Bun; Lord & Berry Shining Lipstick in Cherry and A new favourite base duo: Nars Sheer Glow & L'Oreal Lumi Magique Primer. Favourite post: I love Estee's videos as her happy personality always cheers me up. I am also slightly completely obsessed with Pinterest, find me here, so I really enjoyed watching her Spring DIY video. I am definitely going to give the bright stones and cactus a go! Favourite product: This week my skin has been really dehydrated - probably because I have been enjoying a few too many glasses of wine - so I have been loving the Una Brennan Super Facialist hydrating mask, see my review here. Popping this on occasionally for about 15 minutes leaves my skin looking plump and refreshed - love it! Hope you have all had a good week too!